The Cañada College Art Gallery is pleased to present an exhibition of multimedia paintings by the Bay Area artist Claude Ferguson. The exhibit opened Monday, February 13 and runs through Thursday, March 30. 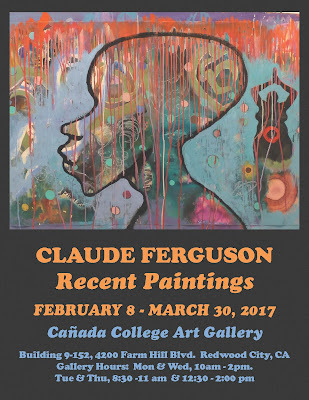 Claude Ferguson holds a BFA from North Carolina Central University, and an MFA from San Jose State University. Claude has worked as an arts educator youth and teens since 1984. He has taught with many Bay Area programs and institutions including the California Arts Council, Santa Clara’s Arts Connect, the San Jose Museum of Art, and The Community School of Music & Arts. Claude was also the cofounder of the Genesis Sanctuary for the Arts in San Jose. . He is also an Afro Jazz musician with the Inner Peace Orchestra. The gallery hours of operation for this show are Monday and Wednesday, 10 a.m. – 2 p.m.; Tuesday and Thursday, 8:30-11 a.m. and 12:30 – 2 p.m.